Brand New Hospital grade medical equipment for home or medical office use. 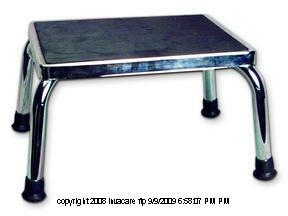 Sturdy foot stool is a great gift for retired seniors who have a hard time reaching high places in thier home. The footstool eliminates troubles making it easier to get to necessities in their house. Nonslip features make this stool an alternative for disabled bathers to step over the bathtub when a walk in tub isn't an option. Exam & patient room set ups are our specialty. Please call or check our eBay store if you need any other equipment.